Notre Dame’s Makayla Hadsell signed with Marietta College on Tuesday afternoon in a signing ceremony held at Notre Dame High School. Bottom row from left, Rhett Hadsell (father), Makayla Hadsell, Kristi Hadsell (mother). Top row from left, Notre Dame softball coach J.D. Whitman, Notre Dame basketball coach/athletic director J.D. McKenzie. Hard working people tend to find their way to successful programs. For Notre Dame’s Makayla Hadsell, that fact proved to be true on Tuesday afternoon. Hadsell, who has played in the Titans’ infield over each of the last two seasons, officially signed with Marietta College as the senior will head to the Pioneers’ softball program in order to blaze a trail as a student-athlete from the 2017-18 season on forward. And for the infielder, the opportunity is a dream come true. For J.D. Whitman, the signing is special considering that he’s known Hadsell since her Little League days and has watched her grow into the person that she has become today. 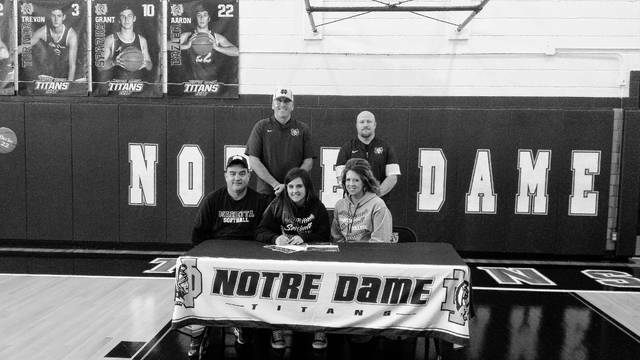 Hadsell, who is Notre Dame’s second softball signee from this year’s senior class, joins Catelynn Ball (Alice Lloyd) in taking on the ever-rare task of signing to play for a collegiate program. According to Whitman, Hadsell, along with Ball, has only helped improve the level of the program as a whole. Since coming to Notre Dame, Hadsell’s confidence in her own game has only grown thanks to the support of the veteran head coach. And at Marietta, it looks as if Hadsell will be heading to a place that supports its players in a similar light. Jeanna Arbuckle, who has coached with the Pioneers since 1988, will begin her 30th season with the program in 2017. In 16 of the previous 29 seasons at Marietta, Arbuckle has guided her Marietta College units to winning records, with a dozen of those 16 seasons featuring teams that have won at least 20 games or more. In nine out of the last 10 years, Arbuckle has led her teams to .500-plus marks, and during her entire tenure, has produced 35 All-Region and 69 Ohio Athletic Conference honorees. She holds an overall record of 520-466-3 over her career as the head coach of the program. That comfort level that Arbuckle has established at Marietta, according to Hadsell, was evident in the time that she spent with her future teammates. At the end of the day, however, Hadsell knows that the opportunity wouldn’t be possible without the support system that has remained stable in trying times.